Bollywood, starved of a mega-hit movie in 2009, need look no further than New York, where the trio of John Abraham, Katrina Kaif and Neil Nitin Mukesh have put up a riveting performance. So what's the storyline about? 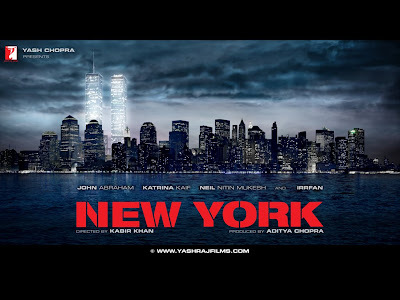 New York is a story that revolves around three friends - Omar (Neil Nitin Mukesh), Sam (John Abraham) and Maya (Katrina Kaif) whose lives are deeply impacted by the fallout of 9/11 attack. Omar, who goes to NYU in the Big Apple on a scholarship, befriends Sam and Maya and the three becomes an immediate hit - inseparable and fun. However, their friendship is impacted by the 9/11 attack, which changes the cityscape and their lives forever. Meanwhile, Omar, who is in love with Maya, becomes heartbroken when he finds that she pines for Sam and relocates to Philadelphia, snapping all ties with the other two. The movie then fastforwards to 2009 and we see Omar detained by the FBI as a suspect terrorist. FBI inspector Roshan (Irrfan Khan) tells bewildered Omar that his friend Sam is actually the dreaded terrorist Sameer Shaikh, who spearheaded the 9/11 attack. Omar is shocked to be confronted with the reality as he knows that Sam is happily married with Maya but agrees to cooperate with the FBI who plants him in Sam's house, using him as bait to uncover the terrorist's plans. But Omar has plans of his own and in his quest to prove Sam's innocence, uncovers truths that stun him and the whole world. 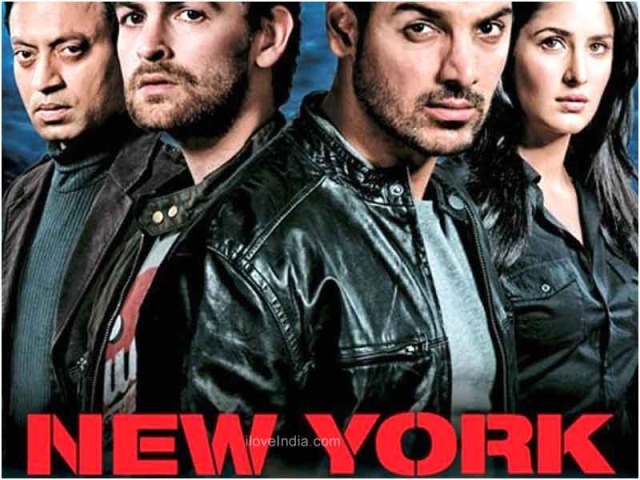 Though dragging at times, New York is a thriller that manages to bring out the best in John Abraham, Niel Nitin Mukesh and Katrina Kaif. Thanks to Kabir Khan, who has tapped their acting potential in New York, John, Neil and Katrina can look forward to signing on some meaty, serious roles in the future. While John creates an intriguing graph for his character and flows with the character's pain of karma with a performance that suggests seamless vigor rather than labored angst, Katrina, comes into her own as an actress of substance, giving her best shot to the last half-hour as a wife of a terrorist trying to keep her moral equilibrium in sync with her husband's sinking values. Indeed, from the carefree effervescent campus girl to the anguished wife, Katrina makes the journey look plausible all the way. And, Neil, as the rosy-cheeked, strawberry-lipped sophomore with stars and stripes in his eyes is fully convincing, credible, intensive and supportive of the two central performances and can safely bask in the glory of his new-found success. He deserves it, especially after he received a lot of flak when his earlier movie Aa Dekhen Zara turned out to be a damp squib despite making a decent debut with Johnny Gaddar. However, Irrfan Khan turns out to be a bore and for no fault of his own since his role as FBI officer made the audience, who has seen him enact the role of a steely interrogator with minimalistic humor (like in Slumdog Millionaire) experience a deja vu. Though New York is not the first movie to synthesize terrorism and friendship, it goes a step further to explore the evolution of terrorism in the context of home-grown emotions such as friendship and betrayal. The movie touches on the physical and mental abuse on innocent Muslims, who are imprisoned merely on suspicion, and their consequent repercussions are effectively portrayed. It challenges the existent codes of cinematic conduct but not by being fashionably unconventional. All in all, New York is a heady thought-provoking thriller that passes on some striking information about what had actually happened in the US post-9/11 attack, without being preachy.